Of all the character traits that I hope my kids learn to embrace, respect is one that tops the list. Most parents know that teaching kids respect is SO important because it lays the foundation for all the other qualities we’d like to see in our kids, including politeness, honesty, integrity and even empathy. For me, showing a healthy respect for others is important because it gets us out of a “all-about-me” centered attitude. God created us to have relationships with others, and we can’t have healthy relationships without understanding we all have something of value to contribute to this world. It’s NOT all about us as the individual, all the time. Essentially, if kids aren’t respectful of others and the boundaries that are put in place by others (and the natural consequences of life), it makes for one unhappy kid! By teaching kids to be respectful, we are setting the groundwork for a child who has every chance of succeeding in school, at their future job- wherever they go! I firmly believe (and common sense supports) that the best way to teach respect is to show respect. Kids absorb so much of what we “teach” through our actions. I’ve definitely learned this the hard way. 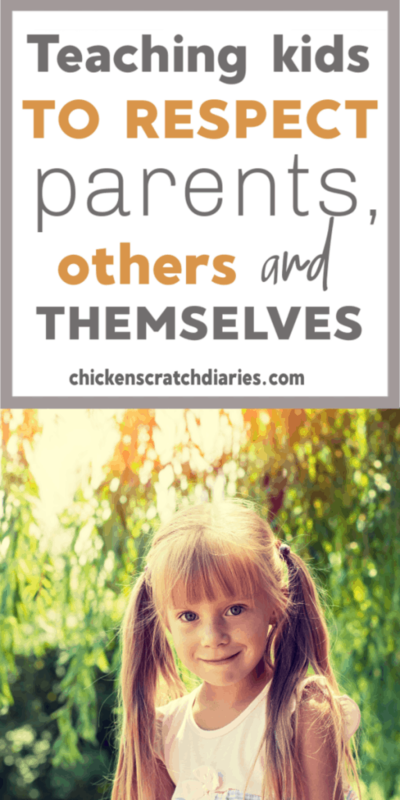 It wasn’t long ago that I realized some of the disrespectful behaviors I was witnessing from my kids were, in a way, a reflection of how I addressed them as a parent. Having an “I’ll show YOU respect!” type of attitude through anger, yelling, negativity is not going to inspire any child to be a respectful, compassionate human being. Sometimes we tend to default to negativity out of frustration. But once we know better — we do better. The truth is, when we’re intentional in our parenting, we can keep the end goal in mind – respectful behavior from our kids – and save our sanity while calmly working towards this goal! Let’s look at three key areas we should think about when teaching what it means to be respectful – and some examples of how to reinforce these concepts with our kids, in a positive way. 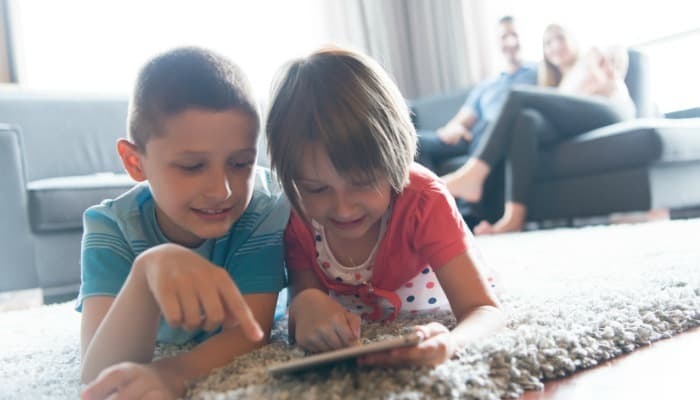 There are several ways to show kids how to treat adults respectfully, but here are some common practices we should reinforce with our kids while they’re young. Some kids at a young age are very shy, especially around strangers, and that’s ok. As soon as they’re old enough to talk, though, it’s good to encourage them to make eye contact with people they know (friends, grandparents, the pastor, etc). By giving other adults your full attention, they will see that this is a respectful behavior and will eventually do the same. Model this by putting down your phone, putting down the magazine when company comes over. Make it a point to make eye contact with your kids over meals and any time they ask you a question. Conversation is hard for little ones with few words, but a simple, “how are you” warrants a response at the very least! I’ve struggled with this with my four-year-old; he talks like crazy at home but when asked questions at church he ducks his head or sometimes runs off before answering. An activity I learned a few years ago is “The Ball is in Your Court”. You can play this at home as a learning exercise. It’s really simple: You toss a ball back and forth with your child (preschool age) and when you have the ball, you ask a question. Then you toss it to them, which is the prompt that it’s their turn to say something. It’s a fun way to model the art of conversation and also being inquisitive about others in a respectful way. At home, it’s easy to gently remind our kids (over and over oftentimes) to ask for things in a nice manner, and to acknowledge kindness from others with a “thank you”. When my son demands, “Give me a glass of milk, mom!” – we stop in our tracks. I’ll say something like, “Whoa. You forgot something there. How do we ask for something that we want?” This takes a lot of practice but I think it’s important to not give into demanding behavior. It’s easy to go into auto-pilot mode and not realize our kids are turning into little dictators – until we hear them repeat these demands to another adult (ouch). You might have heard the saying, it’s better to have friends than to be right. If you have a child who likes to constantly correct other kids or worse, adults, talk to your child about how it feels when other people tells them they’re wrong all the time. It’s not important to point out others’ mistakes at every turn, and other people don’t appreciate a know-it-all attitude! Discuss examples of how others might disagree with their opinions, and how you must still respect them as a person – no matter their beliefs or opinions. I mention this here under “respecting adults” because if your kids are in public school, they will eventually come into contact with teachers who have very different beliefs than them, and they must learn to respect them as an authority figure. When it comes to matters of faith, I have always told our kids (especially our older girls) that they should never compromise the truth of God’s Word. But when confronted with the need to defend their faith, they must tell the truth in a loving way, as Jesus would. If you know me, you know I love the practical wisdom in the Berenstain Bears books, and this book would be a great one to reinforce these concepts. Similar to politeness, sometimes we focus on kids respecting their “elders” and forget that they need to be aware of other kids’ needs for respect. If you have a child just entering school, this is a GREAT lesson to teach them ahead of time. In preschool, my kids were are taught KHFOOTY (kuh-footy): keep hands, feet and other objects to yourself. It’s a very basic concept that creatively teaches respect for other children and their personal space. Sharing is caring, we’ve all been told. As a rule, it IS good to teach kids to share, I think. The problem comes in when they assume everyone else must share too, and that’s just not always the case. Take bullying behavior for example – where a child might demand another child’s toy in the name of “you have to share”. The earlier we can discourage entitlement to others’ belongings, the better. As I mentioned, empathy is closely tied to respect. Have conversations with your child about how it feels when someone wants something of yours that is special to you. Help your child to understand that other kids feel the same way about their special toys and belongings and it’s ok if they would rather not share sometimes. Of course, we could go further and talk about how body safety here- how our bodies belong to us, and outside of a few people who are helpers (mom, dad, doctors), everyone else must fully respect their privacy and their body. Go into detail about what that means, in age appropriate terms. Kids need to know with confidence that their bodies are one thing they NEVER have to share with other kids or adults. Kids need to be prepared that other children may not only have differing opinions and beliefs from them, but they may also look different and act different from them – and that’s ok.
I’m sure many of us have been embarrassed by loud, curious questions from our child about another child with visible disabilities or behavioral disorders. But it’s really on us to help our children appreciate diversity and differences in others. If we teach them to be friendly to all children – regardless of their abilities or appearances – they will develop empathy and understanding. They can be curious while still being respectful. Best of all, they can make new friends! And, they can recognize that God created each person with a unique purpose and He loves it when we value all of His creation. All the above points will apply to parents as well, with a few important distinctions. Obviously, parents are the first relationship kids experience in life. We’re the ones most responsible for making sure they are loved, provided for and so we’re also the most important authority figure in their lives at least while they’re young. As a Christian parent, it’s also my job to show my kids what it means to follow Christ. By teaching them that they are under my authority and must obey me, I’m not only providing necessary discipline but setting the stage for reality: we are all under someone’s authority. We all have someone (or a set of laws, guidelines) we must obey, and if we want to pursue truth and follow Jesus, we must be willing to submit to His authority overall. Again, I believe that modeling respectful behavior in the way we interact with our kids and others is the most important way to teach respect. I’ve been convicted many times of how I’ve spoken about other people when my kids were in earshot. Not that I should be speaking negatively about others in general! But I especially want to be aware of how my kids are internalizing my opinions spoken out loud. Am I encouraging and affirming? Am I sarcastic and dismissive of others’ feelings? Having kids has definitely made me re-think so many other relationships in my life, and I’m actually thankful for the chance to re-examine my own behavior. It’s made me really take a new approach to how I value and respect others – in person as well as behind closed doors. Wouldn’t it be great if all children really understood what respect means, at an early age? This is really a concept that shouldn’t be left to their teachers or other adults – it needs to start in the home. When I look at the headline stories in the news, it seems that so many of the big social issues our nation faces comes down to a basic battle: the need for respect. Kids who never feel valued or respected at home are destined to seek it out from others – if not demand it. The same goes with just about any other unmet needs – love, affection, empathy. Obviously, we have our work cut out for us as respect can sometimes be hard to define and understand, especially for little kids who tend to live by their emotions rather than logic. But I think by following these basic principles, we can set the stage for our children’s long-term happiness, success and overall well-being. Respect will be an ongoing lesson that I know I’ll have to continue to reinforce with my kids through the years. But I’m sure we can all agree that the rewards are more than worth the effort. This is a great post! I think for me, I’ve had to differentiate between respect and honor. It seems like they are one and the same, but sometimes, I feel like adults demand respect just because they are adults. But not all adults reserve respect. They do deserve honor as a fellow human being. Respect to me has to be earned. I’m probably just nit-picking words, but to me, they make a big difference. There are people I don’t respect, but I honor because of the office they hold (ahem – no political discussion wanted). Does that make sense? So I don’t love differentiating between adults, kids and parents because I feel like we all deserve the same honor. Respect, on the other hand, needs to be earned. Can you tell I’ve thought about this a lot? lol. But I feel like this advice is great when applied to everyone, and all of these things should be taught to our kids as they interact with human beings. It will take them far! That is a really interesting distinction, June, and great topic for discussion 🙂 I guess I have a differing definition of the word “honor”, and to me that’s a more distinguished title reserved for parents (Honor your parents), people in authority, people who have made great sacrifices…hmmmm I’d have to think more on this I suppose, so I’m glad you brought it up. One of the definitions of “honor” that I found says to regard with “great respect” so I think that’s what I mean: it’s a higher level respect that yes, must be earned. I have always believed that we should respect all human beings as people created by God – even when we don’t respect their actions or behaviors. It can even set us apart as believers when we have the supernatural ability to respect the person despite their choices. God respects us enough to give us free will and offers us grace when we certainly don’t deserve it, so I guess I see these two concepts intermingle in a way. Respect is a goal, even if it’s true that it’s nearly impossible to do 100% of the time. Thanks for giving me some more food for thought on this! Thank you for this post. These are such simple concepts, but over looked so easily. I think we spend more time teaching our children to share, that we forget it is okay not to, every now and again. So yes, it is important to teach children that when others do not wish to share, we need to step back and understand why.